Click the link at the top of the store to log in to your MyTrainz account. The installation process will continue and then show "Complete". You are now ready to start Trainz. Click on the .exe to self-extract the installer and begin installation. The installer window will open. Click Next to begin installation. The installer will check the servers and present the build you will be installing. Click Install to continue. Click Yes to accept the warning and allow the installer to continue. If the download drops out during downloading, click Retry and the download will pickup again where it left off. Once downloaded, the installation process will continue and then show "Complete". NOTE: For DVD Installations, please see "Offline Installer" above for instructions. If you have trouble downloading and would like instead to order a DVD version by Air Mail for the cost of postage and handling, please click this link. This article assumes you have downloaded the digital version of TANE. For help downloading, please click here. 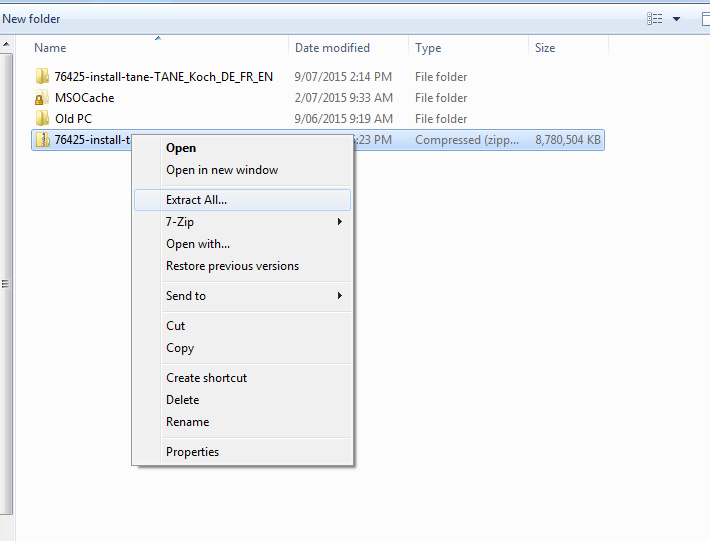 The download for TANE is a single .zip file. This must be extracted prior to running the installer. Once the file has been downloaded, right-click on the file and choose either "Extract All" or "Extract to <filename>". A window will appear showing the unzipping progress. Once the unzipping process is complete, you should have all the files unzipped into a single folder. Once you have unzipped or "Extracted" the files into a folder as above, select the "setup" file and double click to begin the install process. We suggest you choose the default settings unless you have a specific reason to change anything. If your Windows zip file utility does not unzip the file, try installing Winzip or 7Zip and the following the steps above. If you cannot click the "Next" button to accept the Agreement, please follow this guide. The installer shows as "Not Responding" for 5 to 15 minutes during the "Preparing to Install" phase. Don't worry, it will respond if left alone as it is process A LOT of content. Leave your computer running to allow this process to complete. Full installation will take 30-60 minutes on most machines. Longer on slower machines.